Happy National Poetry Month! We’re back from AWP Los Angeles and are ready to take on April full-steam ahead. 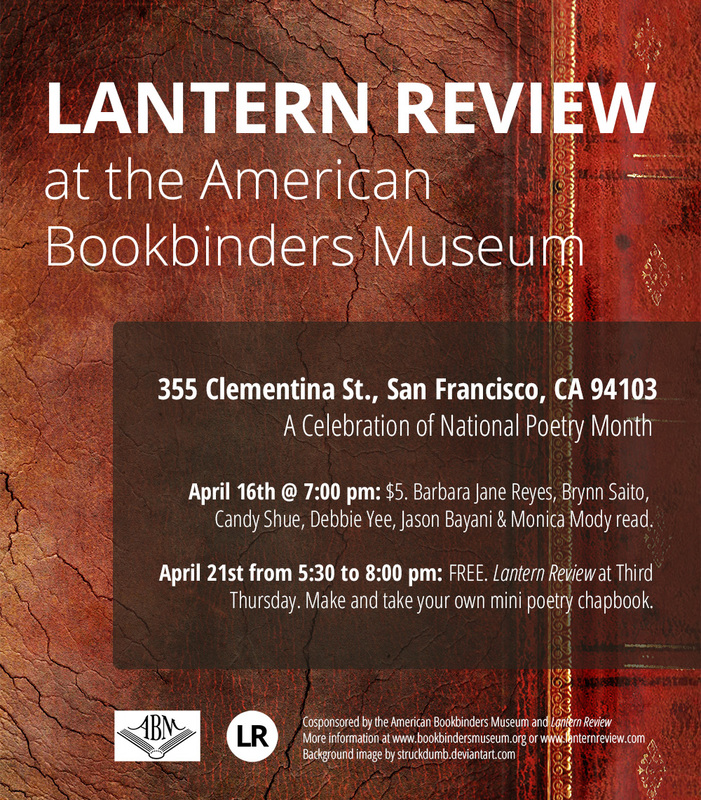 Both events will take place in the American Bookbinders Museum’s building at 355 Clementina Street, San Francisco, CA 94103. If you’re based in the Bay Area, we hope you’ll be able to come out and join us on one or both evenings! We are so excited to get to partner with the museum and (now that we are officially based in the Bay) are thrilled to have the opportunity to celebrate Poetry Month by highlighting some of the amazing Asian American poetry that is being produced right in our backyard. What will you be doing to celebrate National Poetry Month this year? Will you be attending any local events celebrating Asian American poetry in your community? Please let us know about them in the comments, on Twitter, or on Facebook—we’d love to help you spread the word! Yesterday evening, Mia gave you some suggestions of panels that might be of interest to you at AWP 2011. Today, I’ll be giving you a more detailed overview of some of the ways that you can connect with us at this year’s AWP. 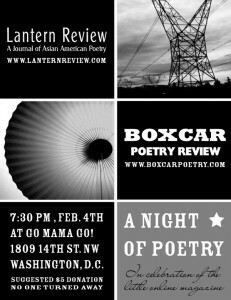 We’ve talked about it before, but it deserves another mention here—the best way to show your support for Lantern Review at this year’s conference would be to come out to the joint, off-site reading that we’re hosting with Boxcar Poetry Review on Friday night (the 4th) at 7:30 pm, at Go Mama Go! (1809 14th St. NW). Entrance is pay-as-you-wish ($5 suggested donation, but we won’t turn anyone away for lack of funds). We have a great lineup of about 16 readers (from both journals) planned, and will provide light refreshments afterward. You don’t have to be a registered conference attender to come to this event, so even if you’re not going to AWP but live in the DC area, please consider coming out to show your support. More information, and the option to RSVP (not required, but it helps us to get an approximate headcount) are available at the event’s Facebook invitation page. Last year, we gave out bookmarks and a special edition run of mini-books at the AWP bookfair. This year, we are trying something different—and it requires your participation! We’ve made a set of 116 numbered postcards, each of which displays either a unique quote from a poem that’s appeared in an issue of Lantern Review, or a blank front for you to fill in with your own favorite line from an LR poem, and will be distributing stacks of them between the tables that have kindly agreed to display some of our materials (Boxcar Poetry Review and Notre Dame Review). We would love for you to stop by and sign out a postcard (or postcards) that appeals to you—and then to take your selection(s) home, respond to the content on the front by writing a poem on the reverse side, and mail your creation back to us by April 15, 2011. We’ll post most of the responses on the blog as they come in, and will publish any that we particularly like in a special section of a future issue. Not to fret if you can’t make it to the conference, though; if we have postcards left over after the conference, we’ll be opening up the project to blog readers, too. As Mia mentioned yesterday, we plan to be at the Kundiman panel and would love for you to look us up there. But we’ll be also attending other panels and events sporadically throughout the conference and will try to Tweet about our plans for the next day each evening before we go to bed. So if you’re not already following us on Twitter (@LanternReview), please do so! AWP 2011 – We’re Hosting a Reading! Yes, the editors will be at the 2011 AWP conference in DC this year (Feb 3-5), and this time, we’re co-hosting a reading! Pay As You Wish ($5 suggested donation; no one will be turned away). If you live in the D.C. area or will be there for the conference, we hope that you’ll consider stopping by. If you haven’t already, please take a moment to RSVP at our Facebook Event Page. We’ll be sharing more details about the reading and about our other plans for AWP as the time of the conference approaches. Issue 2 of Lantern Review is currently in the production and layout stage. We are extremely excited to be able to present what we feel is a tighter, more focused body of work this time around. A sneak peek of some things you can expect to see: a Community Voices feature on Sulu DC (with a secret, surprise element), lots more visual art than in Issue 1, and of course, plenty of wonderful poetry. Our goal is to have the issue out in time for AWP, so keep your eyes peeled in the next couple of weeks!